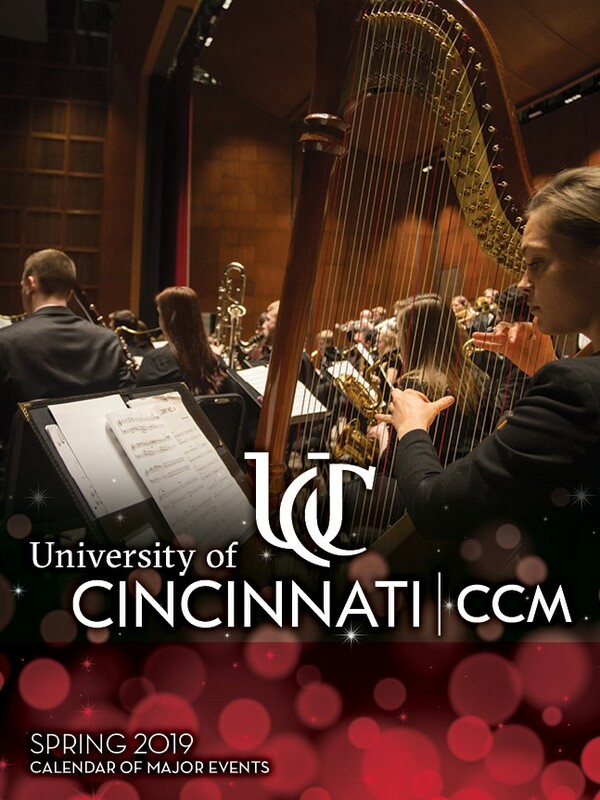 Start your new year at the University of Cincinnati College-Conservatory of Music, which presents a range of free and ticketed events in spring 2019 that span the spectrum of the performing and media arts. Spring brings the excitement of next steps and the promise of the future, as CCM students begin the next phases of their careers. Under the guidance of CCM’s internationally renowned educators, students have spent countless hours honing their skills. Click the graphic to view CCM's Spring 2019 Calendar of Major Events. You can see and hear the culmination of their work, be it during CCM’s BAMM showcase of lighting design, sound design and technical production (January 18); our A View from the Edge concerts featuring music by student composers (February 12 and April 2); our annual Senior Showcases highlighting the excellence of our musical theatre (March 15 and 16) and acting majors (March 29); our Wind Symphony’s world premiere of a work by the winner of CCM’s composition contest (March 29); our Piano-Pow-Looza concert of student performers (April 7); the Theatre Design and Production Student Portfolio Showcase (April 13) or any of the other wonderful events listed in our Spring 2019 Calendar of Major Events! This spring our Mainstage Series also brings The Hunchback of Notre Dame (March 7-10) and Mozart’s La Clemenza di Tito (April 12-14) to Corbett Auditorium, while the inspiring drama Our Country’s Good (Feb. 13-17) and the fairytale ballet Cinderella (April 26-28) come to Patricia Corbett Theater. Learn more about CCM’s spring schedule of performing and media arts events by referring to the list below. You can also view a digital copy of CCM’s Spring Calendar of Major Events by visiting issuu.com/ccmpr/docs/ccmspring2019calendarbooklet. All events listed here take place in CCM Village on the campus of the University of Cincinnati unless otherwise indicated. Admission is free to many CCM performances, although some events do require purchased tickets or reservations. Please see individual event information for details and ordering information. All event dates and programs are subject to change. Visit ccm.uc.edu or contact the CCM Box Office at 513-556-4183 for the most current event information. Unless indicated otherwise in the event listings below, tickets can be purchased in person at the CCM Box Office, over the telephone at 513-556-4183 or online at ccm.uc.edu/boxoffice. Featuring Mozart’s String Quintet in C Major, Spohr’s Duo for Two Violins and more. Featuring works by Chopin and Brahms. Emily Levin of the Dallas Symphony Orchestra joins Colin Davin in a concert of works by Manuel de Falla, Maurice Ravel, Dylan Mattingly and Will Stackpole. Featuring works by Britten, Ravel, Fuchs and Fauré. Prepare to be dazzled by the spectacular creations of CCM’s talented stage lighting, technical production and sound students as they come together to present performance art of robotic lighting and technical systems integration in this biennial event! Admission: FREE, but seating is limited and provided on a first-come, first-served basis. Pat and Julie always supply their audience with something wild and crazy! Featuring songs from the stages of Broadway and cabaret tunes, plus music from new composers. Party favors will also be provided, so don’t miss it! Featuring sonatas by Prokofiev and Brahms. Featuring a newly commissioned piece for mixed media from CCM Commercial Music Production students. Additional works to be announced. Tickets: Purchase tickets online; $25 general, $15 non-UC students, UC students FREE. The Ariel Quartet’s 2018-19 CCM concert series is made possible by the generous contributions of an anonymous donor, The Estate of Mr. William A. Friedlander, Mrs. William A. Friedlander, Dr. Randolph L. Wadsworth, Mr. and Mrs. Frank Bloom, Mr. and Mrs. J. David Rosenberg, Mr. and Mrs. Harry H. Santen, Elizabeth C. B. and Paul G. Sittenfeld, Mr. and Mrs. Thomas E. Stegman and Dr. and Mrs. Theodore W. Striker. Playing music from the heart, Craig Bailey presents a recital of soul, ballads, be-bop and a taste of pop music. Featuring music of Schubert, Fauré and Britten. Join us the following day at 2 p.m. in Mary Emery Hall 3250 for a master class with Graham Johnson featuring CCM voice and piano students. Tickets: Purchase tickets online; $15 general, $10 non-UC students, UC students FREE. An annual favorite! CCM’s Streel Drum Band presents an evening of traditional music of Trinidad, along with pop, folk and reggae compositions. Nashville studio legend and trumpet virtuoso Steve Patrick joins the CCM Jazz Orchestra in this high-voltage concert of some of the most exciting music in big band history. 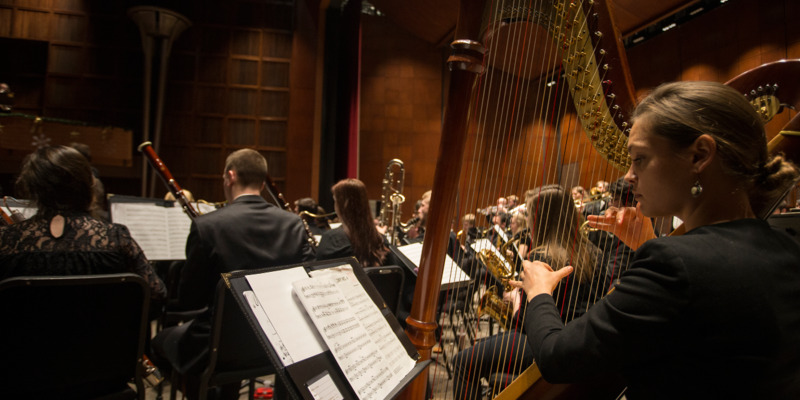 Music inspired by biblical drama, folk songs, festivals, other cultures and nature serves as the setting for this program featuring the many talented musicians of the CCM Wind Ensemble. An evening of inspiring works, including a new composition by alumna Jennifer Jolley, Gustav Holst’s timeless classic Hammersmith, and music by John Williams from Star Wars: The Force Awakens. The CCM Chamber Orchestra (formerly the Chamber Players and Café MoMus) performs an evening of works featuring the harpsichord and piano, highlighted by Richard Strauss’ Der Büger als Edelmann (Le bourgeois gentilhomme) Suite. Updated to free and frivolous 1920s Vienna, this perennially popular operetta returns to CCM with its captivating melodies and a few wry surprises! Admission: Admission is free. Reservations are required. Tickets become available at 12:30 p.m. on Monday, Feb. 4. Please visit the CCM Box Office or call 513-556-4183 to reserve. Limit two tickets per order. CCM’s nationally recognized Brass Choir performs classical, popular and folk selections, featuring brass ensembles large and consisting of students from the CCM horn, trumpet, trombone, tuba/euphonium and percussion studios. Featuring works for voice and keyboard by Carl Philipp Emanuel Bach, François Couperin, Mozart, Barbara Strozzi and more. A showcase of music by CCM student composers. Set in Botany Bay in 1789, Our Country’s Good is a darkly comedic tale based on the true story of Australia’s first theatrical performance. A marine lieutenant decides to put on a play to celebrate the king’s birthday. He casts the play with convicts who populate an Australian prison camp. Few of them can read, let alone act, and the play is produced against a background of food shortages and barbaric prison punishments. Our Country’s Good is an inspiring tribute to the transforming power of drama. For mature audiences. Tickets: Purchase tickets online. Prices start at $28; discounts available for UC and non-UC students. Preview performance tickets start at $15. Featuring works by Grieg, Piana, Liszt and Poulenc. Join us after the performance for a master class featuring CCM piano students. The program features two masterworks – Jonathan Dove’s The Passing of the Year (2000) and Igor Stravinsky’s Les Noces (1923). The 20-minute The Passing of the Year features double chorus and piano in settings of poetry by Blake, Dickinson, Peele, Nashe and Tennyson performed by the CCM Chorale. The 24-minute Les Noces captures the essence of a Russian peasant wedding and post-wedding party with four pianos, six percussionists playing 17 instruments, vocal soloists and chorus. Cincinnati Youth Choir and the UC Men’s and Women’s Choruses offer a variety of choral miniatures highlighting American composers Libby Larsen, Jake Runestad and Timothy Takach. Featuring the complete violin sonatas of Brahms. Dinner at Eight is a comic opera by composer William Bolcom and librettist Mark Campbell, based on the play by George S. Kaufman and Edna Ferber. It is a Depression-era comedy of manners in which the wife of a once-affluent shipping magnate plans a society dinner for an assortment of wealthy or well-born acquaintances. Eventually, the guests' tangled and intimate connections to one another are revealed. The original play opened in 1932 on Broadway at the Music Box Theater, and inspired a star-studded film adaptation the following year. Admission: Admission is free. Reservations are required. Tickets become available at 12:30 p.m. on Monday, Feb. 18. Please visit the CCM Box Office or call 513-556-4183 to reserve. Limit two tickets per order. CCM’s annual Essentially Ellington Festival, sponsored by Wynton Marsalis’ Jazz at Lincoln Center, returns in full swing! The daylong event features the region’s top high school jazz ensembles, and the gala concert will feature the CCM Jazz Orchestra with a special guest artist from the Jazz at Lincoln Center Orchestra. Please join the CMP faculty for an evening of original music and arrangements, featuring Tom Haines, Dan Karlsberg, Ric Hordinski, Brad Myers, Nick Fryer, Ellen Graham and special guests. The CCM Chamber Orchestra (formerly the Chamber Players and Café MoMus) performs theatrical chamber music from a wide variety of inspirations. Showcasing the superbly talented young students from the Starling Preparatory String Project performing Brahms’ Violin Concerto with soloist Skye Park and Bartók’s Divertimento for String Orchestra. The CCM Wind Symphony performs an evening of music from a broad spectrum of styles and inspirations, featuring the epic Winds of Nagual by Michael Colgrass and faculty artist Kim Pensyl’s Saxophone Concerto. Consisting of beautiful serenades for wind instruments and highlighted by Beethoven’s classic Octet, this concert will thrill and delight. CCM welcomes Andrew Henderson, Chair of the Organ Department at the Manhattan School of Music, for a special guest artist performance presented in collaboration with the Covenant-First Presbyterian Church Organ Festival. Henderson will also host a master class from 10 a.m. to noon on Monday, March 4 at Covenant-First Presbyterian Church. This repertoire reflects historical figures and locations as well as fictional stories inspired by musical theatre, ballet, Javanese gamelan and ancient mythology. Come experience the next generation of emerging choreographers as CCM dance majors take the stage with exciting and diverse new works. Admission: Admission is free, but reservations are required. Tickets become available at 12:30 p.m. on Monday, March 4. Visit the CCM Box Office or call 513-556-4183 to reserve. Limit two tickets per order. Based on the 1831 Victor Hugo novel with songs from the Disney animated feature, The Hunchback of Notre Dame begins as bells sound through the famed cathedral in 15th-century Paris. Quasimodo, the deformed bell-ringer, observes all of Paris reveling in the Feast of Fools, but he is held captive by his devious caretaker, the archdeacon Dom Claude Frollo. He escapes for the day and joins the boisterous crowd, only to be treated cruelly by all but the beautiful gypsy, Esmeralda. Quasimodo isn’t the only one captivated by her free spirit, though — the handsome Captain Phoebus and Frollo are equally enthralled. As the three vie for her attention, Frollo embarks on a mission to destroy the gypsies and it’s up to Quasimodo to save them all. In 1999, the musical premiered as Der Glöckner von Notre Dame in Berlin. Parental discretion is advised. Victor Hugo’s novel contains mature themes and situations, which may be distressing for young viewers. Tickets: Purchase tickets online. Prices start at $32; discounts available for UC and non-UC students. Showcasing Starling violin students from the college and pre-college programs performing concertos for violin and orchestra. Selections by the CCM Chorale will include choral pieces, quartets and solo songs by Franz Schubert. CCM’s nationally recognized Brass Choir performs classical, popular and folk selections, featuring brass ensembles large and small consisting of students from the CCM horn, trumpet, trombone, tuba/euphonium and percussion studios. Admission: Admission is free, but reservations are required. Tickets become available at 12:30 p.m. on Monday, March 11. Visit the CCM Box Office or call 513-556-4183 to reserve. Limit two tickets per order. Comprised of students from all 14 of UC’s colleges, the UC Men’s and Women’s Choruses and Cabaret Singers present the music of Arneson, Copland, Ramsey, Schubert, Szymko and Tormis. The CCM Chamber Orchestra (formerly the Chamber Players and Café MoMus) performs famous works of iconic composers of the 20th century. CCMpower invites you to see our musical theatre “stars of tomorrow” in action at the 27th edition of the “Not Famous Yet” showcase featuring the Class of 2019 prior to their New York City debut. The annual CCM Musical Theatre Young Alumni Award will be presented at the showcase. Tickets: Special ticket pricing and limited seating. For more information, call CCM External Relations at 513-556-2100. Experience tomorrow’s opera stars today as CCM hosts its prestigious national competition, featuring current and new students vying for tuition scholarships and cash awards. See and hear our musical theatre “stars of tomorrow” in action at the 27th edition of the “Not Famous Yet” showcase, featuring the Class of 2019 prior to its New York City debut. Building tomorrow’s leaders, one voice at time, the Cincinnati Youth Choir sings of growth, encouragement and unity through new commissions and music from around the globe. The Ariel Quartet’s 2018-19 CCM concert series is made possible by the generous contributions of an anonymous donor, The Estate of Mr. William A. Friedlander, Mrs. William A. Friedlander, Dr. and Mrs. Randolph L. Wadsworth, Mr. and Mrs. Frank Bloom, Mr. and Mrs. J. David Rosenberg, Mr. and Mrs. Harry H. Santen, Elizabeth C. B. and Paul G. Sittenfeld, Mr. and Mrs. Thomas E. Stegman and Dr. and Mrs. Theodore W. Striker. An evening of fantastical dance music from various time periods and locations including the United States, France and England. Enjoy the talents of the CCM Acting Class of 2019 in its exciting industry showcase prior to its professional debut in New York and Los Angeles. The evening performance will be followed by the 16th annual DOLLY awards recognizing excellence by students in the Acting Department, as well as a reception in the Baur Room. The CCM Wind Symphony performs a concert featuring Gustav Holst’s classic Hammersmith alongside thrilling newer works by Adam Gorb and Joel Pucket, featuring a world premiere by CCM composition contest winner Julien Monick. Electronic music has been understood as continuing the aesthetic progress of Western art music — and yet, electronic studios are heterogeneous, blending technologies and personnel from science, military engineering, radio and “low art.” In this talk, three vignettes illuminate the network that embeds German electronic music from the 1920s through the 1960s. The combined CCM Philharmonia and Chamber Choir present Handel’s Zadok the Priest, composed in 1727 for the coronation of King George II, and J.S. Bach’s Magnificat BWV 243, composed in 1723 for Bach’s first Christmas in Leipzig. The Philharmonia performs J.S. Bach’s Brandenburg Concerto No. 4 in G Major and Handel’s Water Music in F Major. Solos, duos, trios and quartets for classical guitar. In the year 3,000,458,000 B.C., the salt-eating yeasts are the only living creatures on earth, and they’re up against a food shortage, a strange new emotion called “love” and the oppression of a tyrannical king. When the king’s dreamer of a son ventures out of the known yeastiverse, the yeasts’ story – and ours – is changed forever. An area premiere from the creators of Urinetown and The Sting. Admission: Admission is free, but reservations are required. Tickets become available at 12:30 p.m. on Monday, April 1. Visit the CCM Box Office or call 513-556-4183 to reserve. Limit two tickets per order. The Third Annual Collegiate Women’s Chorus Festival, hosted by UC Women’s choruses from Xavier University, Miami University and Northern Kentucky University will join in a concert to celebrate music for the treble voice. Tickle your fancy with a variety of selections that showcase CCM's award-winning piano students at one, two and three pianos. There’s something for everyone at this annual fan-favorite concert! Featuring an evening of electroacoustic and computer music by CCM students, faculty and guests. Join us for a thrilling concert of rarely-performed music for winds. Mozart’s last opera seria displays some of his most memorable and marvelous arias! The story centers on Roman emperor Titus (Tito) who must choose a wife, but is unable to find a suitable match. In his search for an empress, Tito narrowly avoids an assassination plot instigated by his protégé Sesto and the former emperor’s daughter, Vitellia, who wants the throne for herself. Caught between his duty and his heart, the emperor must choose whether to rule with mercy or with an iron fist. Come see the spectacular work of CCM’s talented senior and graduate Theatre Design and Production (TD&P) students as they highlight their portfolios, website and designs in this annual event! A gala event will follow the showcase from 6-8:30 p.m. The CCM Percussion Ensemble performs chamber works for percussion from Cage and Hovhaness, through DeSantis, Udow and Andriessen, to King Crimson. An evening of music for guitar with cello, flute and voice, and other combinations. The CCM Chamber Choir and strings present 20th and 21st century choral classics — John Corigliano’s Fern Hill and Ēriks Ešenvalds’ In Paradisum — contrasted with one-on-a-part chamber ensembles performing J.S. Bach’s motet Der Geist hilft BWV 226, Monteverdi’s madrigal Altri Canti di Marte / Due belli occhi and Vaughan Williams’ Serenade to Music. Every piece of music has a story of its own. This program conveys various stories, folklore and cultures, drawing inspiration from Chinese traditions, Scottish dances and 20th century composition techniques. A young, charismatic senator pursues policies that could have long-lasting repercussions for public education. A group of college students tries every technique available to them to change his mind, from occupying his lawn to collective lucid dreaming. What is the nature of activism? How do we hold legislators accountable? And what is the young senator’s mysterious twin up to? Admission: Admission is free, but reservations are required. Tickets become available at 12:30 p.m. on Monday, April 22. Visit the CCM Box Office or call 513-556-4183 to reserve. Limit two tickets per order. Celebrate spring’s arrival with a fully staged fairytale ballet choreographed by guest artist Karen Russo Burke, Artistic Director of the Dayton Ballet. A poor girl wishes to escape the authoritarian rule of her evil stepmother and stepsisters, so her fairy godmother gives her a ticket to the ball! The girl meets Prince Charming and they fall in love, but she vanishes when the clock strikes midnight. Set to Sergei Prokofiev’s memorable score, Cinderella is known for its jubilant melodies, lush scenery and graceful retelling of the timeless romance by Charles Perrault. Tickets: Purchase tickets online. Prices start at $28; discounts available for UC and non-UC students. Showcasing the superbly talented young students from the Starling Preparatory String Project and featuring violin soloist Christina Nam in Mozart’s Violin Concerto No. 5 in A Major and Tchaikovsky’s String Serenade. Join the CCM Wind Symphony for its 2018-19 season finale, featuring internationally acclaimed jazz percussionist Steve Houghton in a concerto by CCM faculty artist Steve Allee, and faculty artist James Bunte performing John Mackey’s dazzling Concerto for Soprano Saxophone. Highlights include a work by faculty composer Miguel Roig-Francolí, and Michael Martin’s stunning new Symphony. The final concert of CCM Wind Studies 2018-19 season showcases classics from well-known European composers. The area’s most talented middle school and high school instrumentalists perform traditional and contemporary band music. Comprised of non-music majors, UC’s campus orchestra is designed to provide students with an opportunity to share their love of great music from the orchestral repertoire. Join the UC Bearcat Bands for a thrilling evening of music. Consisting primarily of students majoring in fields outside music, these future musical citizens are sure to impress and inspire! The CCM Youth Ballet Companies feature talented students from ages nine through adult, performing traditional and contemporary works choreographed by CCM and CCM Prep faculty. The Cincinnati Youth Choir, including CCM resident choirs and community choirs continue to sing for the future featuring songs of life, love and laughter. CCM’s Junior Musical Theatre Intensive provides a challenging and disciplined educational experience for students ages 9-14 with a special interest in musical theatre. Join the students for their spring performance as they showcase what they’ve learned this year! The area’s finest young string musicians perform a concert of music composed and arranged for string orchestra.